The ELGEF Plus branch saddle system Topload for large dimensions up to 2000 mm by GF Piping Systems offers now an even safer installation. The integrated pressure testing connection for the outlet dimensions d160 and 225 mm offers the possibility to perform a pressure test of the branch saddle before the tapping of the main line and therefore a safe and cost-effective installation. 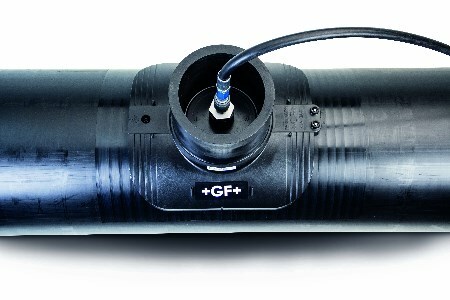 GF Piping Systems adds the feature of an integrated pressure testing interface to its Topload branch saddle system for large dimensions with an outlet dimension d160 and 225 mm. The system now allows a safe pressure test up to 18 bar in advance of the tapping of the main line. The pressure test for the Topload saddles with main pipe dimensions d315 to 2000 mm can now be done simply and efficiently with a standardised testing plug. This not only reduces the testing effort, but also saves time and expensive mechanical joints. The ELGEF Plus branch saddle system Topload convinces based on the proven principle of the ELGEF Plus modular system. In the area of large PE installations for gas, water and industrial applications it provides superior modularity and flexibility. The functional design and the interaction of the high performance components, enable a simple, quick and safe assembly onsite.